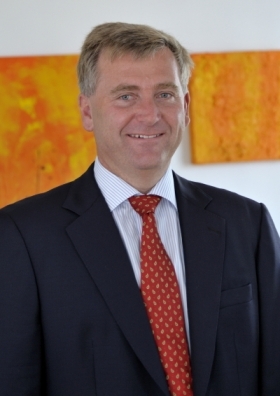 Guenther Apfalter has been president of coachbuilder Magna Steyr since 2007. Canadian-Austrian auto parts giant Magna International Inc. has named Guenther Apfalter to the newly created position of Magna Europe president. Apfalter will continue to serve as president of the group's Graz, Austria,-based contract manufacturing arm, Magna Steyr, and will report to Magna CEO Don Walker. In April, Magna restructured itself to create a global group structure with global product presidents and regional presidents. The company did not appoint a president for Europe at that time because former co-CEO Siegfried Wolf handled those responsibilities. Wolf's decision to resign effective Nov. 15 created the need for a Europe president. Wolf will join an affiliate of Russia's GAZ Group. Apfalter, who has a degree in agricultural engineering from the University of Vienna, has been head of Magna Steyr since 2007. Prior to that the 50-year-old Austrian native served as Magna Powertrain's president for Europe and Asia and as an executive vice president and board member at Magna Steyr. In another key move at Magna's European operations, Manfred Eibeck has been appointed president of Magna Russia. He will add this job to his current role as Magna Europe executive vice president. Eibeck also will report to Magna CEO Walker. Magna ranks No. 5 on the Automotive News Europe list of the top 100 global suppliers, with sales to automakers of $17.4 billion in 2009.